May 26 to June 1 is Disability Awareness Week and a new committee at the University of New Brunswick is ensuring that accessible learning is available to all students. Out of 100 University of New Brunswick students, between three and four have a diagnosed disability and are registered with UNB Fredericton's Student Accessibility Centre. Large classes are likely to have one student with ADHD, one with mental health issues (anxiety disorders, bipolar disorder, depression, mood disorder, OCD, panic attacks, post-traumatic stress), and one with a learning disability. A fourth is likely to have a chronic health issue, brain injury, Asperger’s Syndrome, or physical, hearing or visual limitations. The actual incidence of many of these disabilities is likely much higher and the entire student body is made up of a wide diversity of backgrounds, learning styles, and abilities. 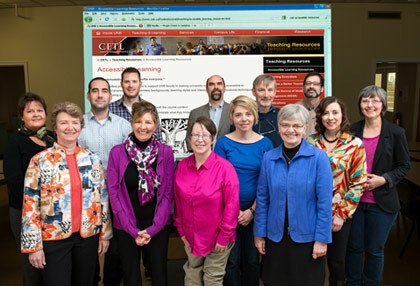 For these reasons UNB has formed the Accessible Learning Committee (ALC) - a joint committee between the Student Accessibility Centre and the Centre for Enhanced Teaching and Learning that is primarily made up of faculty and students who offer support to instructors on teaching techniques that are inclusive. The newly formed committee promotes the use of instructional methods that accommodate student diversity and special needs while benefiting everyone, according to the principles of Universal Design for Learning (UDL). The committee's activities involve raising awareness of the issue, providing resource materials to instructors, conducting workshops and providing consulting and coaching to instructors requesting assistance. UDL is a set of principles for curriculum development that give all students equal opportunities to learn. UDL is an evidence-based approach to creating instructional goals, methods, materials, and assessments that work for everyone - not a single, one-size-fits-all solution but rather flexible approaches that can be customized and adjusted for individual needs. This accessible learning initiative has been undertaken to help implement the 2010 UNB Strategic Plan goals of increasing access to education for under-represented groups and providing a positive learning environment. By providing variety in presentation modes, learning activities, and assessment options, diversity in the classroom will be better accommodated. For information, contact Jody Gorham, director of Student Accessibility Center or Bev Bramble, instructional designer, Teaching and Learning Services.